The Play series… entertaining instructional programs that illustrating both scale and chord voicings made recognizable by some of the world’s greatest guitarists such as Hendrix and Clapton. This release focuses on the blues legend, B.B. King. B.B. King, multi-Grammy Award winner and inductee to both the Blues AND Rock & Roll Halls of Fame, has been ranked by Rolling Stones Magazine as one of the top three guitarists of all time. His sophisticated style has been said to influence virtually EVERY electric blues guitarist since. Max Milligan, will show how to incorporate the different techniques into your own style so you too will be able to play like B.B. King! Max has a kind and gentle manner, and with the camera close ups of both hands, makes it easy to imitate this unique guitar styling. You feel like you’re sitting in the room with this teacher, having a private lesson. Max Milligan has a relaxed and confident way of playing, much like B.B. King himself. 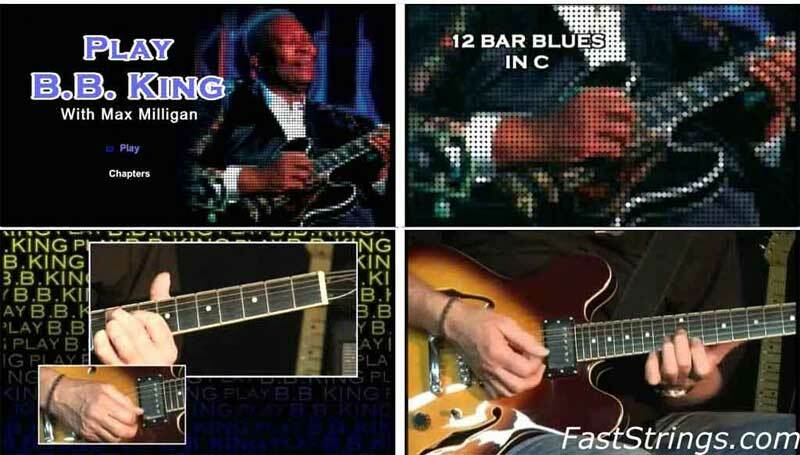 All of the phrasing, the use of choke bends and vibrato that is BB King’s trademark style of play are laid out in an easy to follow format.